Not one or two ... 275! These torrential falls about 275 of them within a distance of 2.7 km some of them about 82 meters in height, the deafening sounds of all combined, all closely accessible has such an impact that anyone who has a heart gets overwhelmed. 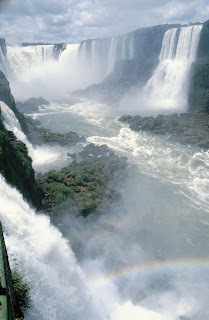 ‘Iguazu has a daily beauty in it which makes Niagara ugly!’ it made Eleanor Roosevelt who remarked with a sigh “poor Niagara” comparing Iguazu with Niagara of her native land. Niagara Falls –the pride of her continent –where millions stand in ovation; a not so much heard of waterfall from a remote corner of the world; outsmarting Niagara came something like a shock to the former first lady. 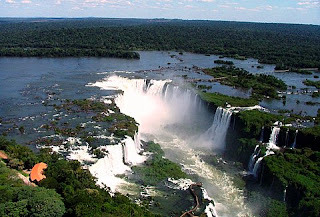 These falls altogether 2.7 km in length comes between Argentina and Brazil; have the added advantage of easy access either from Foz do Iguazu of Brazil or Parana and Puerto Iguazu of Argentina. It was Alvar Nenez Cabesa who discovered the falls in 1541; it still remained there un-noticed to be explored by Baselli in the 19th century. One of the falls is named after him. 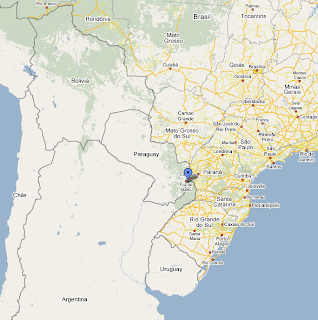 Now this site is accessible even by train in the Argentina side. The Andes Altiplano is an ecologically unique region and it has much more in store to delight visitors; but Iguazu Falls remain as the trump card in pulling most of the visitors to these regions, it is a virtual money spinner for both Brazil and Argentina. For Latin America being number one in geographical features is only a matter of habit as it has ever remained numero uno in this aspect. Andes is the longest mountain range in the world, Amazon Forests (most dense rain forest on earth), Amazon River (the largest river on earth), Angel Falls (the tallest water fall on earth), Atacama Desert (the driest part of the land), La Paz (the highest state capital), Titicaca Lake (world’s highest navigable lake), Puerto Taro (southern most city in the world), Machu Pichu (center of Inca Culture) are just some of the surprises South America has to offer. There is a myth about these falls prevalent among the natives; though it pictures God Almighty in a poor light it is quite imaginative. Once upon a time in a village near the river there lived a beautiful village damsel by name Naipi. Seeing her charm none other than God fell in love with her and approached her parents to give her in marriage. Parents found the ‘boy’ suitable and immediately agreed! But for the misfortune of the Almighty the girl had a lover by name Taroba; and both fled in a canoe through the river Iguazu. God Almighty was not magnanimous enough to spare the young couple and chased and overtook them. Then with his magic sword the Almighty in a rage cut the river and the earth in to two! It is believed that the couple fell in the gorge thus formed and perished. 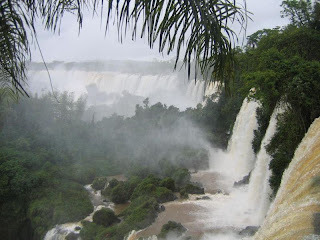 But Iguazu still keep on falling! The throat of the devil! Iguazu Falls are in the River Iguazu between Argentina and Brazil, the whole areas come under the Iguazu National Park Argentina and Iguacu National Park Brazil both UNESCO approved World Heritage Sites since 1984 and 1986 respectively. One of the spectacular sights is the ‘Devil’s Throat’ (Gargantua do Diablo) the ‘U’ shaped falls, where water from a horse shoe shaped platform falls in to a deep semi circular gorge, the massive fall of water from a height of a 24 storied building is nothing but awesome. The roar of falling water frightens anybody and thus it has got this strange name Gargantua do diablo; meaning devil’s throat! It is no wonder that these falls are called so as the water discharged during peak time is about 400,000 cubic meters, and the sound produced must be proportionate! The water is collected in the canyon flows in to River Rio Parana in Argentina. There are bus services from various points of Puerto Iguazu in every 45 minutes. During seasons there is consistent flow of tourists to this location. Iguazu has been recognized as the 8th wonder of the world by National Geographic and remains as a crowd puller during season. Once inside the location there are services of authorized guides available who can talk most of the important languages in the world. December to February is times of heavy rains and the falls can be seen at its wildest form; but there may be problems as hilly tracts may be damaged due to the rains and tour operations may be closed. March to August is best as the rain may be over and clear atmosphere will offer better vision. Most visitors fly from Buenos Aires or Rio de Janeiro as if in a hurry have a look and return as if it is a single fall; but at least two days are required to pay a meaningful visit, one full day at the Brazilian side and one for the Argentinean locations. One who have never visited Latin America in his life may seem these locations very familiar ‘looks as if I had seen it somewhere’, it is true all people who have watched the blockbuster movies ‘Godzilla’, ‘The Mission , ‘Moon raker’ have seen these locations with awe have seen them. The names of the films mentioned are just few there are numerous films shot in these sites making them familiar even to the most confirmed couch potato! The Argentinean side is best for closer views and easy access where as the Brazilian side offers a wild panoramic view. There had been times when the river got completely dried up upsetting the visitors, because there will be no waterfall without water! But no reason to worry as such events occurs only once or twice in a decade and even that will be only for short period like one or two weeks.